You have a lot of choices about where to buy your shed -- big box stores (eg, Home Depot and Lowe's), other retail locations, and online. Some of the basic things to use when comparing a shed from Company X and us are the ability to either have something that suits your needs, in stock, or the ability to quickly handcraft your shed to every specification in a short period of time. We also recommend that you work with a true shed expert who’ll take the time to find out first, what you intend to use your shed for, then guide you on style, colors, and shed options that make sense for you. Be wary of uneducated sales people who try to sell you solely on appearance! Of course we believe that our sheds are the best constructed, but we know it would be best if you reached your own decision in choosing the highest quality shed for the best value. We’ve put together some objective, unbiased advice to show you what to look for when shed shopping. Do staples show on the shingles? If exposed, staples will eventually rust and shingles will leak over time. Tip #1: Inspect any structure you are considering to see if you can see any staples on the shingles. Does the roof have a drip edge? A drip edge-the piece of metal on the roof line gives a neater appearance and acts as barrier to keep water off the soffit and out of your building. Tip #2: Before you buy, ask if a drip edge is used on their sheds. Fiberglass shingles or organic shingles? Two types of asphalt shingles are used commonly: organic and fiberglass. Organic shingles are constructed of felt paper that's been saturated with asphalt. Then, a coating of adhesive asphalt is applied over that. All of our shed roofs have fiberglass shingles because they have a base layer of glass fiber reinforcing mat. Fiberglass mat is made from wet, random-laid fiberglass, bonded with urea-formaldehyde resin. The mat is then coated with asphalt, which contains mineral fillers and makes the fiberglass shingle waterproof. Tip #3: Before you buy, ask if fiberglass shingles are used. Do they use 2' x 4' or 2' x 3' lumber? By using 2 x 4’s in the construction of our sheds, the finished product is stronger. The roof won’t sag and the whole building will be a heavy duty structure. 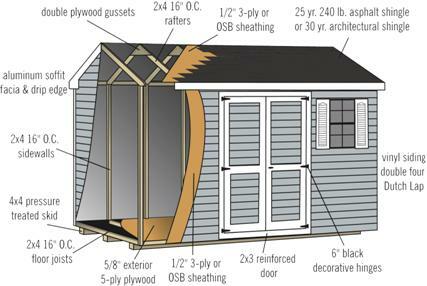 Tip #4: Find out the dimensions of the materials used in any shed you consider. Our floors are built with exterior-grade flooring. The floors are 5 layers thick, which means it's much sturdier than many shed floors. 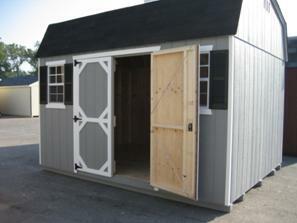 Tip #5: Ideally, select a shed that uses an exterior grade, 5-ply floor. Are the studs placed every 16 inches or 24 inches? By spacing our studs closer together (every 16 inches), our buildings have as many as 4 extra support beams for added strength. A common way to cut corners is to use fewer studs by spacing them every 2 feet. You'll find this in many lower-quality sheds. Having studs every 16 inches make the floor sturdier too, because there are more support beams underneath it. Tip #6: Make sure to ask what the distance between studs is on any building you are considering. If you’re considering a garage or storing more than 1,200 lbs in your storage structure, we suggest selecting even more support by requiring the joists be placed every 12 inches-giving you the best support available in the business. In fact, any garage we build comes with this tighter spacing for added support as a standard feature. Tip #7: Ask if floor joists are spaced every 12 inches or if you can get this option. We use #1 Grade 2 x 4 lumber in all of our sheds. The 2 x 4’s are the most important piece in any shed. This higher grade gives you tighter spacing and added support. Tip #8: Find out which grade of 2 x 4s are used. If you want a long lasting structure, then you’ll only want #1 quality lumber used throughout. We use double reinforced 2 x 4s on the top sill plates for the interior framing. By using an extra set of the durable 2 x 4s, our shed walls won’t bow or sag, giving our structure a longer life and a cleaner look. Tip #9: Ask to see if double 2 x 4s are used in the top sill plates. All our doors are reinforced by bracing or 2 x 3s. Some sheds are still built without any kind of bracing, but our sheds come with either bracing or 2 x 3s to provide added support and longer life without any sagging or twisting. Tip #10: Check to see if the doors on the shed are reinforced with either bracing or 2 x 3s or your doors could quickly sag or twist. All doors come with locks as standard on our buildings. There are still some sheds out there that don’t come with a lock, and even if they do, it could be an extra charge. We believe that a lock and key set should be a standard feature, so we include it. Tip #11: Ask if your shed will come with a lock and key for free. By only using the larger sized indoor latches, your shed doors will be easier to open up. We could have skimped and gone with the standard size, but the stronger latch makes it easier to get a hold of and gives your door better leverage. Tip #12: Ask if the larger size door latch is used or if theirs are made with the standard size. By painting our wooden sheds with 2 coats of the heavier paint, our paint will last longer and stand up to the elements better, keeping your shed looking like new for longer. Tip #13: Ask how many coats of paint are used and if it’s the heavy paint.